A £3m EU-backed pilot project to test how solar energy technologies can be integrated into the fabric of buildings to make them more energy efficient has been launched by Finance Minister Jane Hutt on 27th June 2013. Led by Cardiff University’s Welsh School of Architecture and in partnership with Tata Steel, the Sustainable Building Envelope Demonstration (SBED) project aims to explore how the role of the building facade could be transformed to incorporate systems which can generate, store and distribute renewable energy. 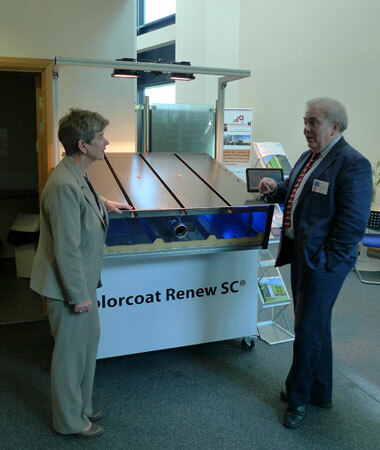 The launch, which takes place during EU Sustainable Energy Week (24 – 28 June), highlights how SBED will design, model, test, prototype and monitor low carbon building systems in eight properties across Wales. The types of buildings to be included in the pilot are residential, commercial, industrial and institutional such as schools. The project is backed with £1.8m from the European Regional Development Fund through the Welsh Government. SBED will closely monitor the construction, implementation and real-life performance of the demonstration systems, disseminating best practice to the wider industry. Information gathered during the project will enable the economic viability and cost effectiveness of the technologies to be assessed for the different building types. The project has also received funding support from Tata Steel, and Higher Education Funding Council for Wales.